Q: You've recently received the William H. Flanigan award for Distinguished Service from the Inter-university Consortium for Political and Social Research. Congratulations! Tell us about the award and your work that led to it? D.T. : I was first associated with ICPSR, the premier social science data repository, in 1974 as a grad student at the University of Michigan, when I participated in its summer program offering statistics courses. I later worked at the ICPSR archive processing datasets such as the American National Election Studies. Then when I came to UC Irvine Libraries in 1986 as a data librarian and bibliographer, I began helping faculty and students use ICPSR datasets for secondary data analysis, in my role as the ICPSR official representative. The award is intended to acknowledge the contributions of individuals representing ICPSR member institutions. Q: Do you think this type of external professional work is integral to your work providing high quality service as a UC Librarian? D.T. : Big data is a term bandied about now, but there have been data librarians for decades, even before I became one. We've always advocated data sharing and data "liberation" - even before open access became vogue. We help academics find data especially for reuse. Secondary analysis of existing datasets - without having to gather your own data -- is one of the ways for scholars to make better sense of the world in which we live. Librarians are also now exploring ways to help researchers manage data throughout the research lifecycle. Q: How about personally, it must be rewarding to work with scholars from across the country and to be recognized for your work? D.T. : It's humbling but also nice to be recognized while I am still alive and kicking! But to be honest, there are many more deserving colleagues who have also struggled in the trenches. Q: You've also got some of your work in the Smithsonian right now. That's quite an accomplishment. D.T. : Yes. Thanks. My involvement in the Asian American movement is featured in a traveling Smithsonian Institution exhibit on display at the Japanese American National Museum in L.A.'s Little Tokyo, through 27 October 2013. “I Want the Wide American Earth: An Asian Pacific American Story,” features Asian American activism on one of the display panels. I wrote the entry for one graphic: the cover of a 1980 issue of Gay Insurgent, which I also edited. 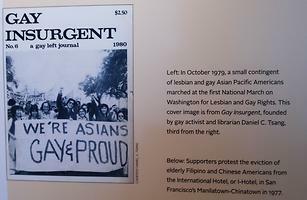 I'm in the cover photo which shows marchers at the first lesbian and gay march on Washington in 1979, behind a banner proclaiming, “We’re Asians, Gay & Proud!” The exhibit first premiered at the Smithsonian’s National Museum of American History in Washington, D.C. this summer. I wrote a blog post about how this image was resurrected after so many years. Q: In addition to your librarian work at UCI, you have a podcast and a related blog. Tell us about those interests and the types of stories you cover. D.T. 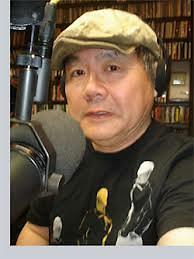 : I started doing radio in 1993 on "Subversity" on KUCI - the name of the show hints at the focus - the name being derived from diversity, university and perversity, as well as of course, subversion. It's become just a podcast now but I still try to stir things up by asking uncomfortable questions that challenge conventional wisdom. Q: What other community work have you done? D.T. : Concurrent with being a public affairs host on KUCI, I was organizing Asian Americans against police surveillance and abuse, fighting a "moral panic" over Asian gangs. We formed the Alliance Working for Asian Rights and Empowerment in Orange County . My anti-surveillance work led me to successfully sue the CIA for spying on me. In settling Tsang v. CIA, the agency agreed not to spy on my First Amendment-protected activities again. At the time, before the Edward Snowden revelations, the NSA claimed it had nothing on me. Q: As a member of UC-AFT, can you comment on the importance of having union representation and on being involved with your union? D.T. : As a graduate student at Ann Arbor, I first began organizing graduate student workers there - we went on a very successful strike in 1975 as the Graduate Employees Organization for a month! The strike led to a union that continues today. I've been involved off and on in UCAFT as a local leader, contract negotiator and publicity person, so I am a firm believer that as long as we stay united we can overcome many if not all obstacles put in the way by management.